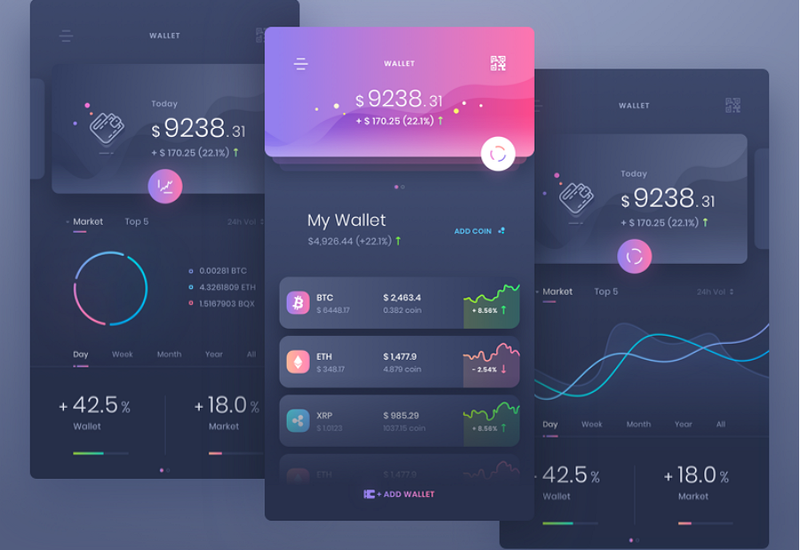 This article lists 10 of latest mobile app UI design examples in 2018 and these excellent interface designs will also surely inspire you in mobile UI design. YONO.MP3 mobile app is a music app that can not only allow users to listen to music, but also check radio to know word news or other interesting contents. It is a good place to share and discover their favorite songs, albums and artists. It has really clean and eye-catching interfaces with a perfect color scheme: all interfaces are designed with beautiful color contrasts between red and black, which make it typical and fashionable. And color gradients are also used in some buttons and smaller sections. That makes people focus on these special parts and give users a sense of hierarchy. The overlapping of photos, buttons and icons also make it beautiful and comfortable for users. So, it is user-centered, beautiful and easy to use. Watering Tracker App is a mobile app that can remind users to water plants and track watering stats for every plant. And it will be really useful for people who love growing plants. It is really a great idea to monitor the watering stats of plants and also remind users to water their plants timely. Moreover, its background photos and images of different plants under monitoring are really vivid and fresh to let users have a good mood while using. It also offers many plant details for users to clearly and easily know plant conditions, like humidity, temperature, light and more. 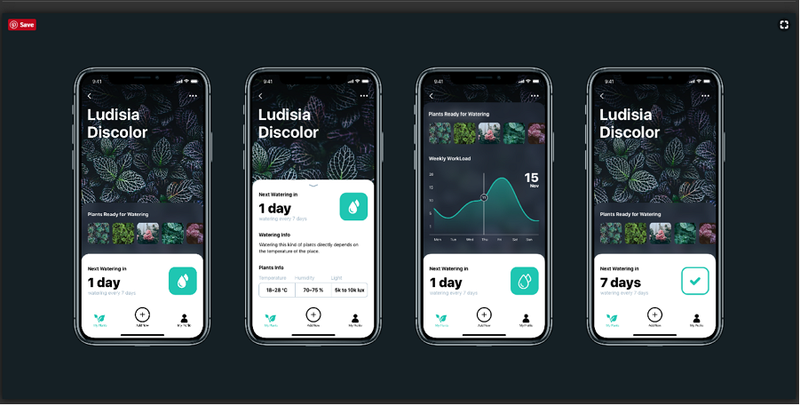 Its color scheme, black background with white and green icons/buttons can not only echo with the main theme of green plant, but also make this app more acceptable for users. 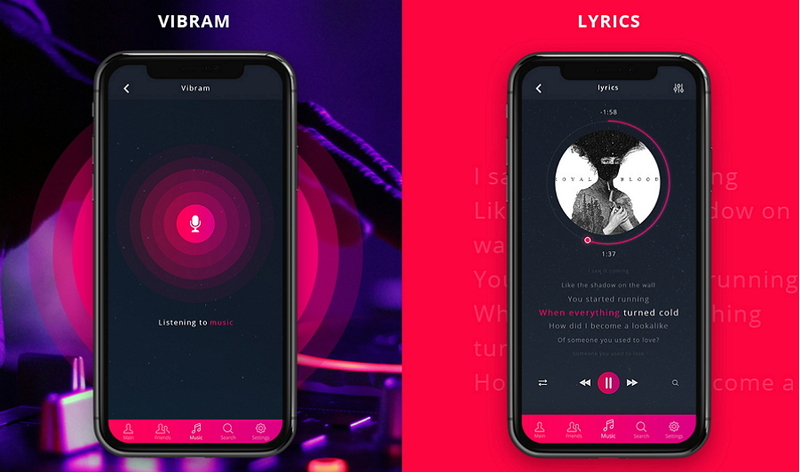 Listen is also a music app prototype that aims at offering users unique and pleasant listening experiences even when they love different music styles. With clear and clean interfaces, people can easily find and listen to their favorite songs from a variety of music channels or based on different scenes, like New, Radio, Theme, Album, Drive, Wash, Sport, Work and Meet, etc. Its customized interface also allows users to listen to music based on different moods. So, it is a perfect choice when you want to enjoy and lose yourself in the music world. 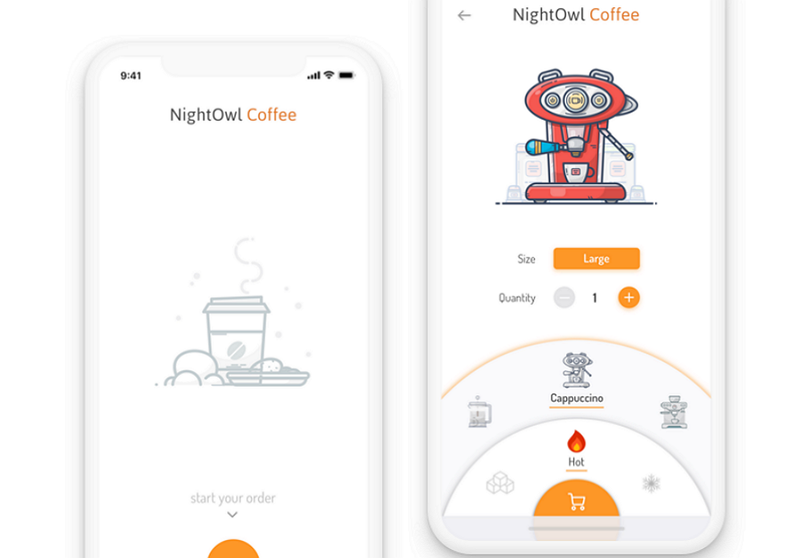 Coffee Ordering App is a mobile app that can help users order and get hot coffees in different sizes and qualities quickly based on their own needs. It features for a distinctive illustration style. Its cartoon coffee machine with beautiful colors and geometric graphic elements is really cute and beautiful. Its pure background decorated with simple gray graphics and yellow buttons makes it really clean and neat. So, it is really clean and simple. 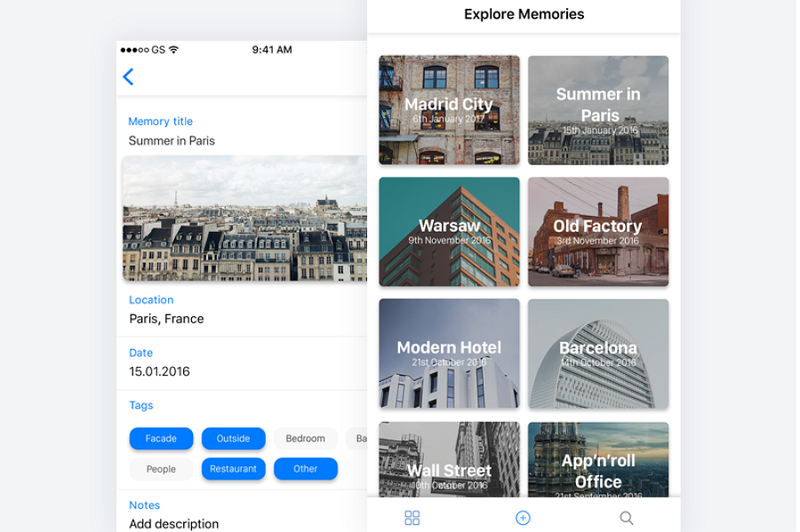 Roomframes app is an iOS app that can help people record and remember places that they have visited, especially the rooms where they have slept before and do not want to forget in the future. So, in this aspect, it is more likely to be a managing app. It adopts several frame interfaces for users to add different places, hotels, workstations or new offices, etc. And every place is allowed to add further dates, photos, descriptions and more details so that it could help remember everything unforgettable. And its pure white background makes all added photos, tags, notes and descriptions more outstanding, which could be good for users to recall or share these memories with their friends or families. 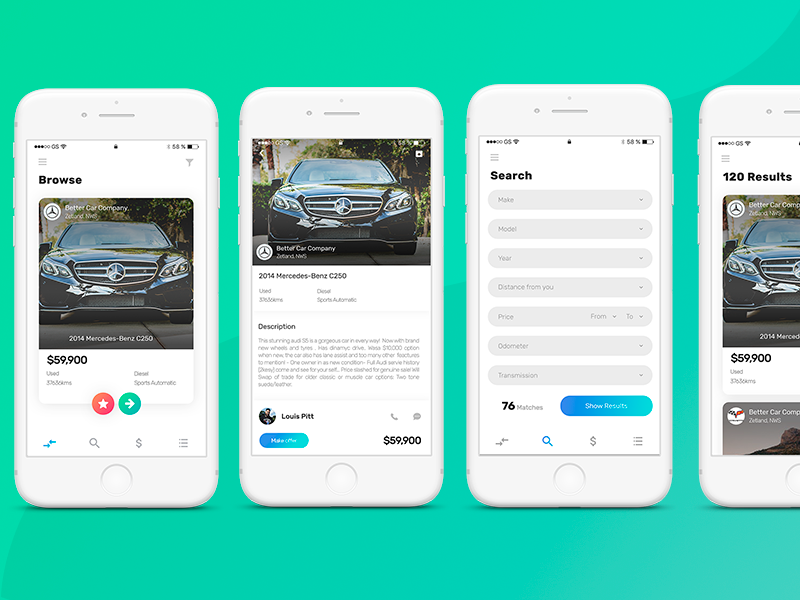 iOS App Slide Card is an iOS mobile application that can help users classify, search and do business with cars, and it is also a good tool for people to connect and socialize with different car lovers. It is designed with pure backgrounds and let users focus on car information, like car photos, prices, descriptions and owner information, etc. Its Search interface also enables users to find their desired cars with simple clicks. So, it is simple, clean and useful. Karoline is a mobile shopping app that enables users, especially female users, to search and buy pants, jackets, dresses and more clothes as they wish. Its pure pink background is really sweet and attractive for female users. And icons and buttons are also simple and easy for users to search for more details of different clothes based on their needs. Moreover, it offers a series of pages that almost include all details that a user may need while searching and buying clothes, like Home, My account, My orders, Shopping Cart, My Favorites, My invitations and Settings, etc. It is really useful when you really need to buy clothes online with your phone. Space is a mobile application that allows users to manage life more effectively. It features for providing useful information based on users’ schedule, like traffic and weather information, in the morning, and offering theme and alarm sounds to suit different moods of users at night. With an illustration style, it also features many vivid animated buttons, photos and options. Its blue color also lets users feel good and comfortable no matter whether they use it in the morning or at night. Moreover, it enables users to manage their lives with many functional interfaces, like Mood calender, Daily services, Today’s Brief and Voice Diary, etc. So, it is sweet and appealing. 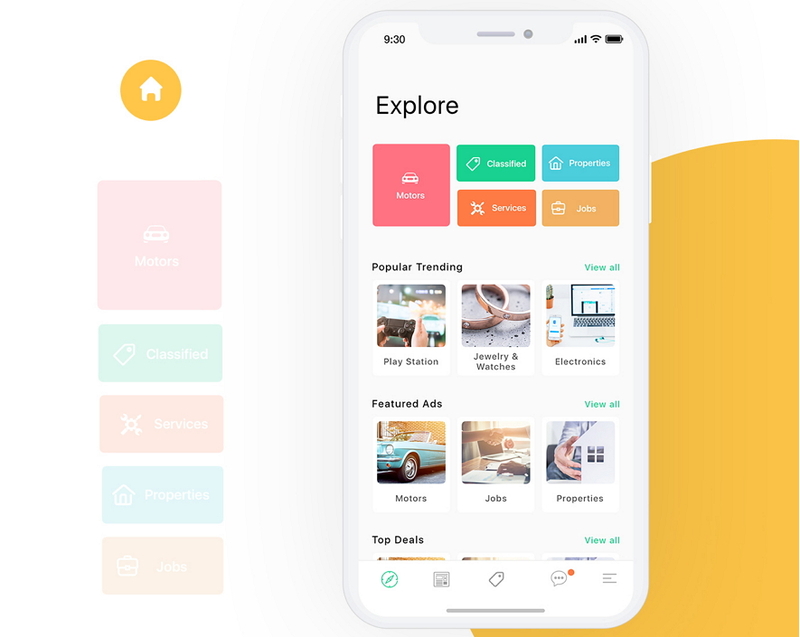 QuickBee is a classified advertising app that has offered life information for users in different categories, like cars, real estates, jobs, services, education and more categories. Users can easily sign up and create a profile there to search needed life information, check popular trending items and browse featured ads, etc. It stands out for neat designs and awesome colors. Simple and colorful buttons show diversified categories clearly and clean frames present popular trending and featured ads orderly. Its vector icons are also good and easy to understand. And it mainly consists of some useful screens, such as Login Screen, Explore Screen, Category Listing Screen and Detail Screen, etc. It is a financial app that allows users to manage their money. Its beautiful color contrast and gradients are really distinctive. Simple icons and colorful geometries make all interfaces simple and impressive. From my point of view, except creative UI/UX design ideas, good collaboration between designers and developers is also vital in helping you create a stunning mobile application. Fortunately, Mockplus iDoc, a fresh online design collaboration & handoff tool for designers, developers and product managers, has been launched recently and is a good choice for you to try. Mockplus iDoc can help generate specs and assets automatically after you import mobile app designs with one click, gather feedback and suggestions from other designers, web engineers and MPs, create interactive and animated prototypes to share and test easily, and make the entire design collaboration easier online. Overall, while designing a mobile app, never forget to use a handy design collaboration and handoff tool, such as Mockplus iDoc, for better design implementation and handoff online. Well, those are all 10 latest mobile app interface designs we have searched and collected for you. 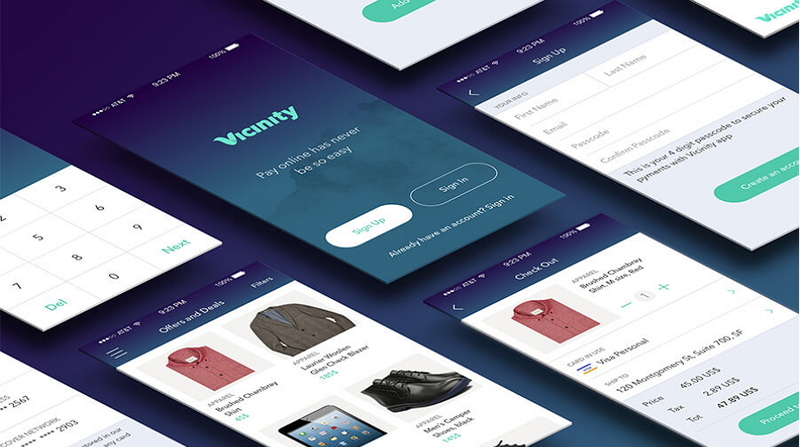 As 2017 draws to close, they can not only help you find new inspirations for the next mobile UI design project, but also could be nice materials for you to catch and predict possible trends in the coming 2018. Hope you will make full use of them to improve your UI/UX design works.